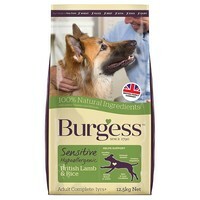 Burgess Sensitive Adult Dog Food (Lamb & Rice) is ideal for dogs with delicate digestion. It's packed with protein and amino acids for muscle development and growth, and crunchy cooked rice boosts energy and aids a healthy digestion, Like all Burgess Adult recipes, Burgess Sensitive has been carefully tested at independent kennels. Burgess Sensitive Lamb & Rice is the perfect food for dogs with sensitive stomachs at a price owners will love. Lamb meal (min 26%), rice (min 26%), sugar beet pulp, animal fat, dicalcium phosphate, calcium carbonate. Contains natural anti-oxidants. My dogs have sensitive stomachs and are also fussy eaters but they absolutely love this food and it doesn't give them any dietary issues at all. Excellent food. My very fussy dog who has a sensitive stomach loves this. Have only just started using this food for my hypo-allergenic dog, but must admit that he loves it. This is the second bag from you, but it will not be the last. Have now used the turkey as well as the lamb and had no problems in feeding my dog. This is marvellous as he tends to be a finicky eater on dry foods.